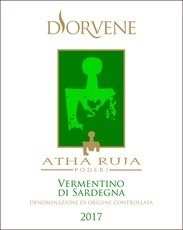 Wine Atha Ruja D’orvene - Royal Wine Merchants - Happy to Offer! There is a sub-region on the island of Sardinia called Gallura. This northern territory is stony and mineral-dense. It is known on the island that something special happens when the Vermentino grape is planted there. The Atha Ruja restored old vines in Gallura to capture the Vermentino’s profound character in a limited production. D’orvene means “veins of gold” in Sardinian referring to the color of the wine. Intensely aromatic with apple, pear, and citrus notes. Full bodied with creamy textures. The dense minerality reveals itself like seashells after a crashing wave. This fine white wine will command the attention of the white wine aficionado. It pairs beautifully with shellfish, grilled fish, and fresh vegetables. 3,000 bottles produced annually.